The Hawaiian Language: More than just Aloha and Mahalo – Straight from NY to Paradise in a Day!!! I am coming up on my two year mark of living on the island. It still seems exciting yet unreal. Originally I was only supposed to be here for one year, or at least that was all the time I was allowed by my friends to leave the east coast. But coming up on two years is also exciting because I feel I am now able to absorb the Hawaiian culture. I am super stoked because I have finally developed an understanding of the key words of the Hawaiian language. It may seem strange to those of you living on the mainland, but really there are Hawaiian words (much more than Aloha, and Mahalo) that I had to learn in order to understand a simple conversation. And now that I am able to follow without hesitation, it makes some conversations so much easier. You may not hear me speak these words naturally, but at least I know what they mean. One of the first facts that I learned when I moved to the island was that the Hawaiian language only has 13 letters. I quickly realized this to be true when I couldn’t pronounce most of the street names. And although I still cannot pronounce many of the street names, I can at least do a better job in trying to figure it out how it should be properly said. So with each day there is a little bit more progress, and each day a step closer to not sounding like a mainland idiot. 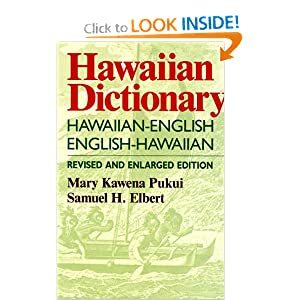 In case you were wondering the 13 letters of the Hawaiian alphabet are A, E, H, I K, L, M, N, O, P, U and W. You know which words are native Hawaiian because these are the letters that are used over and over within one word (words that can be pretty long). Since I work with a lot of local families it helps to actually understand some of the Hawaiian language. Some days it can feel like I live in another country, I learn words by putting them together within the context of a sentence. Hey now that I think about it maybe I can move to Spain or Italy, and still be able to make a way for myself. I have complied a list of the top Hawaiian words that I have found are common to come across. Now if you come on vacation and stay in Waikiki, you may never ever hear these words. But if you decide to venture out to lets say ummmm…Waianae, yeah you will hear these words and a lot more. Other small helpful hints: Children refer to any adult as Aunty or Uncle, it is just respect so don’t get alarmed. You will hear the term “Bruh” a lot and, if you get mad at someone while driving, or if you cut someone off just throw up the “shaka” it makes everything better. Last but not least the phrase “Da Kine” apparently has no real meaning, but goes for anything (yeah I still don’t understand that one). The list goes on and on, these are just a few words to give you are head start so you don’t appear as a lost tourist once you arrive at the airport.